Add comfort to your dining room with this practical and transitionally styled dining set from CorLiving. This set includes four chairs with Beige microfiber upholstered seats and a wood table constructed of hardwood and wood composites. Features a Rich Cappuccino finish that will compliment any decor setting. This quality product offers great value and assembles with ease. Functionality meets style with the elegant Arianna series. The attractive table brings steel and durable melamine together in a cohesive design. There's ample room at the table for family meals or fine-dining with friends. Relax in the comfortable chairs that feature easy-care 100 percent polyester fabric with premium webbing in a striking navy blue. Decorative steel studs along the table and chair sides give this dining set a modern, contemporary look. Whether your dicor is casual or traditional, the Arianna dining series is sure to fit right in and enhance your dining experience. Form meets function with this extendable dining table. The innovative hidden butterfly leaf allows you to create extra serving space in seconds. They can be seamlessly tucked under the table top when not in use, negating the hassle of storing them around your home. The four solid wood dining chairs are designed to conform to the natural shape of your body, ensuring you stay comfortable. Enjoy your outdoor space with the Hampton Bay Cambridge patio furniture set made with beautifully hand-woven wicker and durable steel furniture frames. The patio chairs boast deep, plush weather resistant cushions for ultimate comfort and longevity. The faux wood table has a slat-top surface. Perfect for your porch, patio or sunroom, each patio furniture set includes six stackable dining chairs and one rectangular dining table. 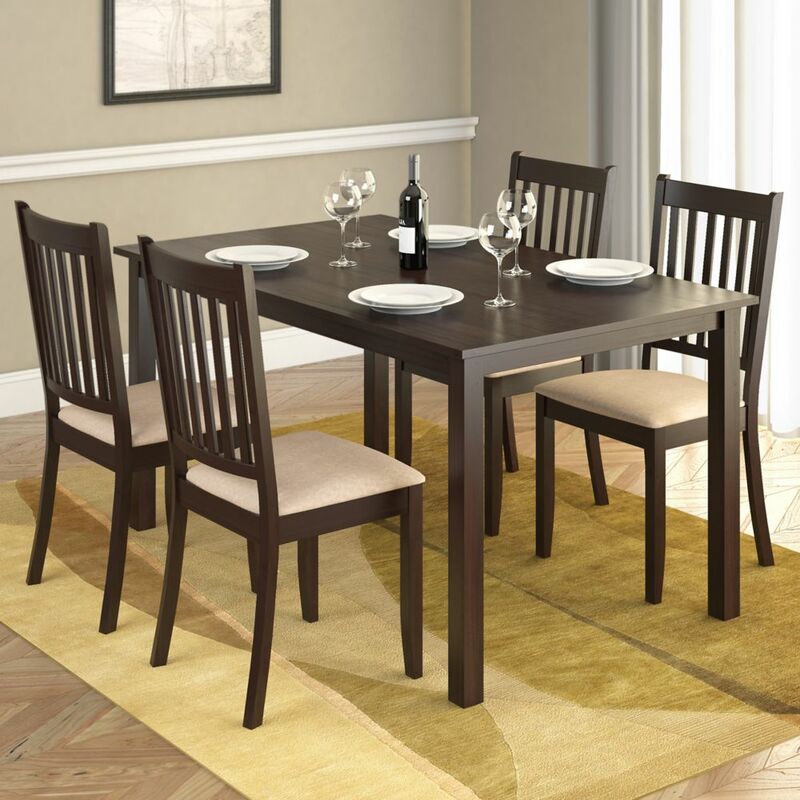 DRG-795-Z Atwood 5pc Dining Set, with Beige Microfiber Seats Add comfort to your dining room with this practical and transitionally styled dining set from CorLiving. This set includes four chairs with Beige microfiber upholstered seats and a wood table constructed of hardwood and wood composites. Features a Rich Cappuccino finish that will compliment any decor setting. This quality product offers great value and assembles with ease.